My husband snapped this, one of the few pics with me! 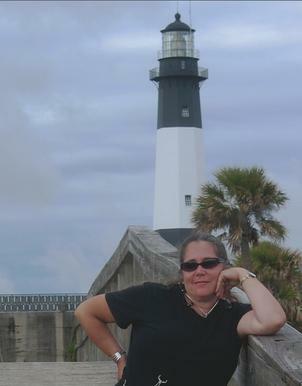 That is the Tybee Island lighthouse in the background. Tybee Island, Georgia is a favorite location to capture images. It's face is always changing- the people, the shore birds, the skyline, with each changing tide. Tybee Island is Savannah's beach with 3 miles to stroll along the Atlantic Ocean. It is a no frills place, that is why we like it! Here's to all who love the shore as much as we do! Stroll along these seascapes, you may begin to feel the breeze upon your face.
. . . Additional pages on the site feature findings on the beach . . .
any room, any coast, any island- your island.